Fri., May 1, 2015, 10:18 a.m. So I’m sitting in a fancy hotel restaurant in Hollywood, staring at what’s supposed to be a plate of Eggs Benedict. I became an Eggs Benedict fan late in life thanks to a pal who thought I’d like it and I did. I like the way the soft runny yolk from the poached eggs blends with the English muffin halves, sliced ham and the tang of the creamy lemony yellow hollandaise sauce. Except that the sauce here wasn’t yellow. This sauce was a color that made me think of the gangrene ward in a Civil War hospital. “Why’s the sauce so, um, green?” I ask the server who’s grinning like a Scientologist at a Tom Cruise appreciation rally. 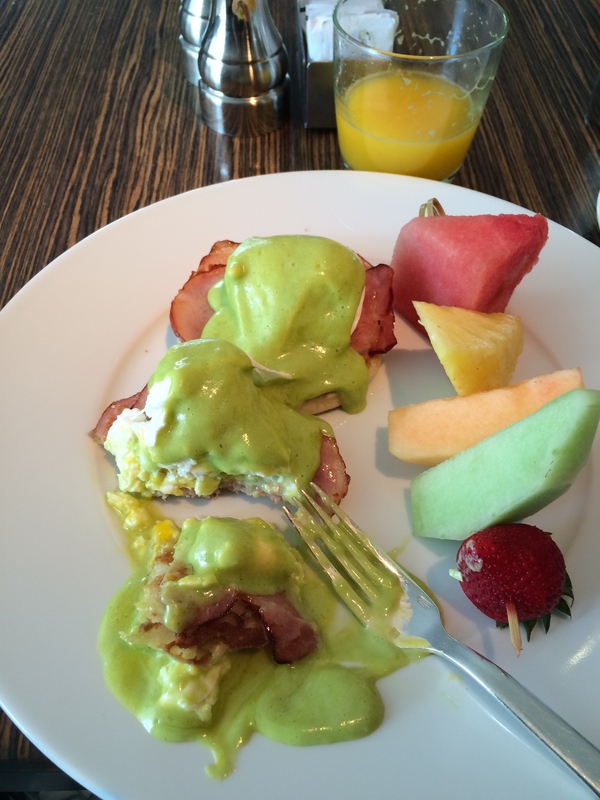 “The chef likes to add pureed spinach and kale leaves to the hollandaise sauce,” she tells me. “Only in Southern California,” I mutter. No, actually I blame the nation’s overexposure to all those insipid TV food shows. Everyone’s a top chef now and no dish is sacred. I'll never be a contestant on "Chopped," but I know enough to know that the only time for pus-colored Eggs Benedict is St. Patrick’s Day after a whole lot of Guinness has been guzzled. But I ate it. I was hungry. Plus more than a little afraid of what might show up if I sent it back with a complaint. “How’d you like it?” my smiley server asked when she brought the bill. Posted May 1, 2015, 10:18 a.m.